This is the best of all the LED watches-the OMEGA TIME COMPUTER TC1. This was the first LED watch introduced to Europe in about 1974. 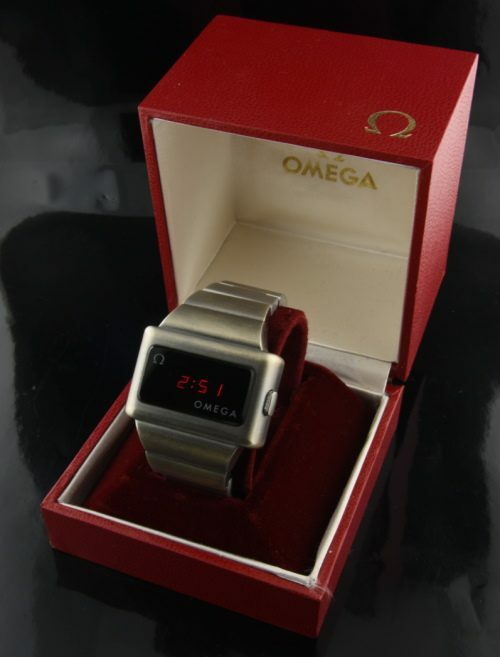 This OMEGA watch measures a hefty 40x53x14mm. with a thick 80 micron layer of white gold plating. The original red screen is looking great. The LED glows very brightly and is accurate. The LED module is original OMEGA and NOT a retrofit. The case and bracelet on this watch are really quite fine and displays NO major wear. Usually, these watches are discovered quite beaten up. I personally love these watches as they really look futuristic on the wrist. All functions are working perfectly. The magnet to set the watch is included (hidden in the buckle as it should). This watch will fit a large wrist and is adjustable. The box is included, along with a blank price tag plus a photocopy of the original instructions. I remember the nostalgic glow of my first LED watch as a child. I’ll miss this one!